Whomp whomp. There're no Powerglides for sale. 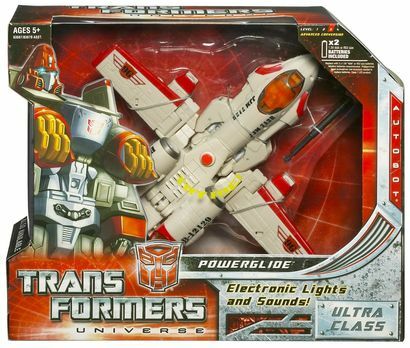 An updated version of G1 Autobot Minibot Powerglide. Despite the colors being wrong, this is still an amazing figure nonetheless. If you can't find the red version at a good price, this is definitely worth getting. This is another case of "I shoulda got it in stores when I saw it" because as soon as I wanted him he was gone. Had to find him on eBay. My only gripe is his legs can either stay too close together or too far apart, not really in between. This is one my favourites of the Universe 2.0 line, even though his paint apps are reversed from what they are supposed to be (I couldn't get a hold of the proper red version). The transformation is quite involved and a lot of fun to do - very well designed and thought out. There's a nice amount of articulation which isn't always present in the larger class sizes, I'm assuming due to their heaviness. They captured his G1 look, while making him look much better - I always thought the original character looked a bit odd. I like the added touch of giving him a "heart" as well. Aside from the color change (they did, however, make a red variant) the vehicle mode for this iteration of Powerglide is pretty cool. It is definitely a fitting tribute to the G1 figure. However his robot mode is kind of ridiculous. His engines become his chest and i am not a fan of this at all. He actually looks like he has 2 giant, light up breasts that make up a majority of his chest. The head design is awesome and the transformation is not too complex but i just cannot get over the odd robot mode.